What started as a sincere desire to bring vaginal steaming to women worldwide, has evolved into more than what we first imagined. The Womb Sauna has successfully supported women worldwide with our method of vaginal steaming, and our company has been able to consistently, every day since our launch, help women know that they are powerful enough to heal themselves. This is our mission, this is the pulse of our company and frames everything we offer. After our launch in 2011, our service portfolio quickly expanded from just the vaginal steam experience, to a unique product line of herbs and other natural feminine products. Women realized that in order to heal everything, their lifestyle would need to change. They allowed The Womb Sauna to become a safe space to make those changes. By 2013 we were not only introducing women to vaginal steaming, but setting an industry standard through our Womb Sauna Practitioner Certification program and online Womb Sauna University. We began to measure the impact of our method and have maintained a success rate of over 90% for positive biopsychosocial impact on our client’s health, within their first session. 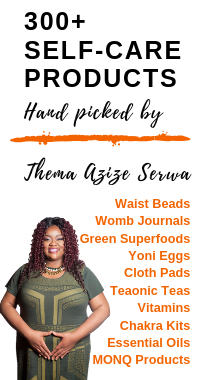 What started with just Thema Azize Serwa, pioneer of the company, quickly grew into an organization not only empowering women to heal holistically, but employing them and teaching them how to bridge the gap between their passions and profits. Through the raw, unapologetic power of women healing in mind, body, and spirit, this company became fertile ground for feminine leadership personally and professionally. Our desire is to be a “fertile womb” in the marketplace showing the strength and power of what happens when women come together whole and healthy. The Womb Sauna brand is about so much more than vaginal steaming. Our company has become synonymous with life transformation. Our clients truly believe that connecting with our services and products is a divine act that allows them to manifest their own power to heal. We are happy that we are seeing the data to back up what our clients are saying they are experiencing. More self-healers. More Practitioners. More Data. More Measurable Impact. Our vision as a company is to create global awareness and appreciation for the impact of the biopsychosocial model of healthcare. We are pioneering an industry standard for vaginal steaming and creating data to measure the impact of this form of medicine to demonstrate that value. We desire women in all stages of life to have the ability to experience affordable services and products for their personal empowerment. In addition, we will provide online 24/7 global access to information that is life-transforming.